The Palumbo Group, which manages yards in Naples, Ancona, Messina, Savona, Marseilles, Malta and Tenerife, has confirmed its successful acquisition of a majority shareholding in the Viktor Lenac shipyard. The company believes the Croatian yard, one of the longest established in the Adriatic, will complement its existing businesses and enhance its already strong regional network. A statement from Palumbo said: "Viktor Lenac, with its 122-year history, is one of the leading shipyards in the Mediterranean not only in the field of shiprepairs and modifications, but also in the design and construction of offshore installations. The acquisition offers us a great opportunity to strengthen our presence in Adriatic region and enhance our service offering as the Croatian yard brings to the group valuable skills, an experienced workforce and considerable know-how." The company believes the acquisition will have a number of benefits, and will in particular help consolidate its position as one of the leading providers of ballast water treatment system (BWTS) retrofit installations, alongside its traditional areas of the strength in the shiprepair market. While its Messina and Malta shipyards have carried out a number of demanding projects for companies such as Grimaldi, CMA CGM, GNV, Scorpio, MSC, Seaspan and Moby Lines in recent months, and Palumbo Naples remains a market leader in complex ferry refit and transformation projects, Viktor Lenac has been benefitting from greater dynamism in the BWTS retrofit sector. Viktor Lenac’s first BWTS retrofit was carried out in 2015 onboard the Cable Enterprise, during its conversion from a conventional cable laying barge into a DP2 cable layer, when a Pan-Asia system was installed. Since then other BWTS retrofits have included fitting Ecochlor technology onboard NS Stream and NS Power, in 2016, Tavrichesky Bridge, SCF Amur and SCF Pechora in 2017 and, most recently, NS Point in 2018. In addition Viktor Lenac has this year installed Wärtsilä BWTS technology onboard the containership Louisa Schulte and a Coldharbour Marine system onboard TMS Tankers’ Suezmax Tanker Bordeira. The latter was the first complete installation of an inert gas-based system onboard a vessel at the yard. The system will be tested and inspected by USCG to apply for type approved certificate. The scope of work on the Bordeira included the installation of 7,000m of electrical cables, 2,500 pipe supports in the ballast tanks and main deck, 3,400m of pneumatic pipes, 18,000kg of steel for the deckhouse and 600m of steel pipes. In addition, Viktor Lenac provided assistance to the contractor Seatec during the installation of 2,400m of glass reinforced epoxy (GRE) piping and 1,400m of medium density polyethylene (MDPE) pipes, the fitting of BWTS equipment and control panels and outfitting the deckhouse with insulation and light steel works. The Louisa Schulte project, also completed this year, was another challenging one, as the container vessel had limited engine room space. The retrofit included pipe modifications in the engine room in addition to the installation of new piping, UV lamps, a filter unit, control and power panels and all the necessary electrical and structural works. This project will be followed by another Wärtsilä BWTS installation onboard a sister vessel, Ludwig Schulte. Viktor Lenac has a close working relationship with SovComFlot, and is retrofitting the Ecochlor BWTS on a number of its vessels. NS Point was in the shipyard from the end of July to late August for drydocking repairs related to class renewal as well as the installation of the BWTS. In this case the yard fabricated three deck houses, involving around 50,000kg of steel, for the BWTS equipment and installed around 8,200m of electrical cables, 450m of hydraulic piping, 300m of GRE pipes, and supported Ecochlor service technicians during the inspection and commissioning of the system. 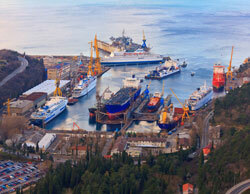 Up to two more projects for SovComFlot are expected to be carried out by the end of this year. As well as seeing a steady stream of commercial vessel repair work, Viktor Lenac continues to enjoy close cooperation with the US Navy. In April, the yard was the first, and so far only, facility outside the US and Japan to simultaneously host three US Navy ships for scheduled maintenance periods, during which various inspection procedures and repairs were undertaken. Despite the group’s notable successes in the environmental retrofit, passenger vessel and US Navy segments especially, 2018 has been a challenging year overall. Palumbo reports downward pressure on ship repair prices in the Mediterranean, primarily because the value of the Turkish lira has dropped significantly, and high discounts offered by some competitors. In addition the group as a whole has noticed a trend for shipowners to cut down on fleet maintenance costs and undertake only the repair and maintenance work that is strictly necessary to meet the requirements of the classification societies. That has brought down average project value. Palumbo’s overriding strategy is based on the creation of an extensive, and unique, network in the Mediterranean, that is able to offer clients technical services without them having to deviate far from their established trading routes. The acquisition of an 82% stake in Viktor Lenac continues that strategy.